We are at Photoville in NYC! If you are in New York this weekend or next, please stop by Photoville’s Container #58, where Living with Conviction is part of Blue Earth Alliance’s grouop exhibit! Photoville Container #58, Blue Earth Alliance-sponsored projects, including Living with Conviction! Vashon Gallery Walk and Conversation! In partnership with Vashon community organizations Showing Up for Racial Justice (SURJ) and Backbone Campaign, and 14 local businesses, the storytelling and advocacy organization, Living with Conviction presents a Community Conversation with formerly incarcerated individuals on August 5, 2018 from 4:00 to 6:00pm at the Vashon Maury Land Trust, 10014 SW Bank Rd, Vashon, WA 98070. The Conversation focuses on “legal financial obligations” (LFOs) that courts impose on criminal defendants at the time of sentencing. Until recently, 12% interest has been accruing on this debt from the date of sentencing. Failure to make monthly payments can result in re-incarceration, without the assistance of counsel. Participating organizations and businesses include Vashon Public Library; SAW - Starving Artist Works; Pure Organic Kitchen & Juicery; Gravy Vashon; Vashon Print & Design; Giraffe; Vashon Bookshop; Gather Vashon; Treasure Island; Zamorana; Snapdragon; Raven's Nest; Rock It! ; Vashon Island Baking Company. In June 2018, Governor Inslee signed into law the removal of the 12% interest accrual on non-restitution-related LFOs – a tremendous improvement. But now, each of the thousands of individuals with accrued interest must petition the court for a waiver of that interest. In doing so, the Washington State legislature just increased the demand for free legal aid. No More Interest Accrual on Most LFOs! On June 7, 2018, House Bill 1783 became effective. What that means is that there is no more 12% interest imposed on newly convicted individuals and no more interest accrual on existing LFOs, excluding victim restitution! This is a huge improvement. But significantly, it is not retroactive. So everyone with LFOs, including all the participants on this project, still owe what they owe. And the interest already accrued does not go away. Every single individual with non-restitution LFOs now has to go to court to request a waiver of their interest. And yet, there is little legal aid available to assist and even less for those who need an interpreter. So while we CELEBRATE, we are also not going to forget about everyone with accrued interest. Stay tuned! A woman and child leaving the Spokane County Courthouse. Once again, the House of Representatives of the Washington State Legislature introduced the LFO Reform Bill, which would eliminate the 12% interest, among other improvements. The House again passed the bill yeas, 86; nays, 12. The bill is now in the Senate with the hearing before the Law and Justice Committee on February 7, 2018 at 10am. The Washington State Legislature, Olympia, Washington. It's been far too long since I shared some news! A lot has been going on -- here are some photos of our last three community conversations and exhibits! The first Living with Conviction panel on July 6, 2017 at the Impact Hub in Seattle, Washington. From left to right, Rickey Roberson, Michael Shoemaker, Sabrina Helton, Maureen Caputo, and Carmen Pacheco Jones. Photo courtesy of Constance Brinkley. Michael, Rickey, and Breon before the community conversation. Photo courtesy of Constance Brinkley. Part of the exhibit at the Impact Hub that ran from July thru August 2017. Deborah Espinosa hugging and thanking Carmen Pacheco-Jones at the artist talk at the Impact Hub, Seattle. Photo courtesy of Constance Brinkley. 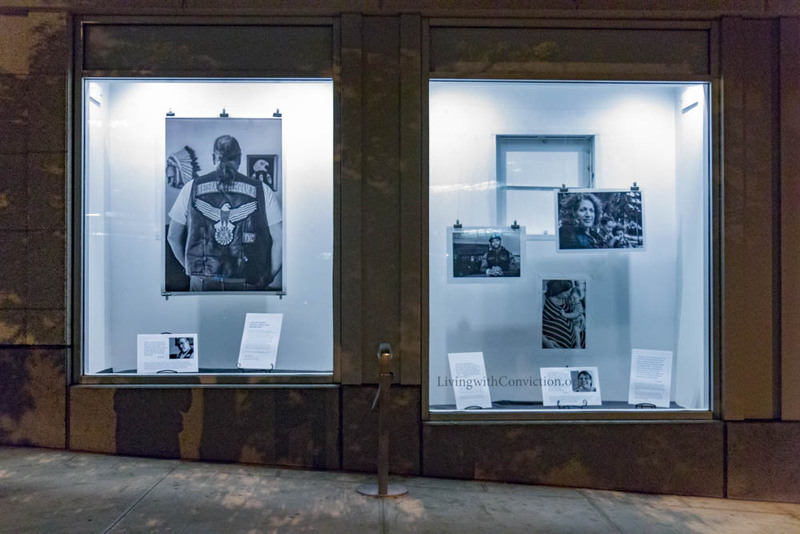 The Living with Conviction storefront window at Meydenbauer Convention Center, October 2017 thru March 2018. We had a small but mighty exhibit at Kent Regional Library in December 2017. Part of our panel during the community conversation at the Kent Regional Library. Our sign at the Spokane Public Library, January 2018. Living with Conviction participant Julie Kelly helps hang her portrait and quote at the Spokane Public Library in January 2018. Living with Conviction at the Spokane Public Library, January 2018. The exhibit is just outside the Community Court. Layne Pavey of I Did the Time moderated our community conversation in Spokane, Washington on January 3, 2018. Spokane Public Library hosted our exhibit and conversation in January 2018. Our three-month exhibit at the Brotman Galeria at the University of Washington School of Law.